While rain slaps the window of the farm house, can't help but wonder, could this be the end of the Olympic alpine backpacking season? The heavy wet stuff hasn't stopped falling here in what would seem to be a week. Can't help not to have bitter sweet feelings. Especially when the clouds break and I can see lots of white stuff on Mount Angeles. Originally hoped to get another 2 weeks in the mountains here, but the weather obviously did not like that plan. My mind is only left to wander the lily filled meadows, eating my way through berries for far as the eye can see; consuming them till hands are stained with the juices and even walking with herds of bugling Elk, during a autumn storm. Regrettingly even hanging off the bottom of a Navy Blackhawk Helicopter just by a rope over the mountains. Memories like these, stick with one for a lifetime. State of the Olympics, since I came off the trail over a week ago. 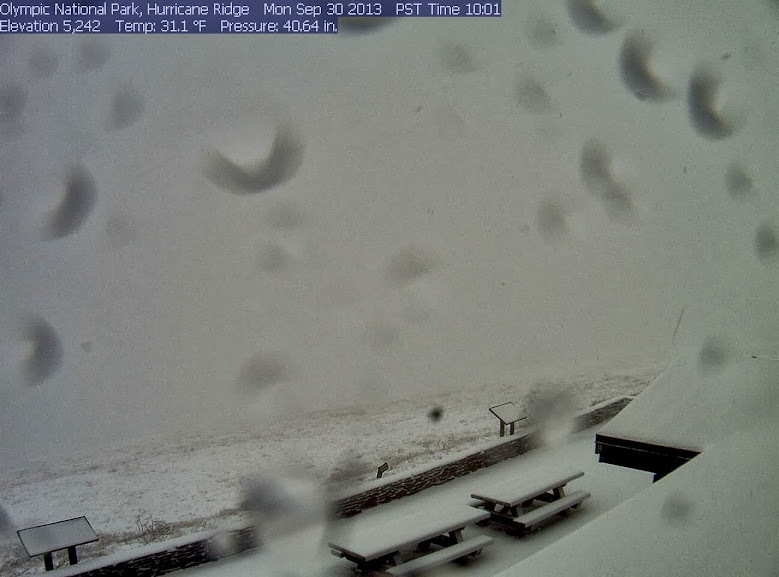 Snowing up at Hurricane Ridge right now. Shot in the remote Queets Basin, with views of the Humes Glacier of Mount Olympus. While complaining about all the sun during our Bailey Range Traverse, my friend Steve replied, 'you should enjoy this, this day could be the last day of summer.' | He was right, it has rained everyday since and now snows in the mountains.